There are two breakfast rituals that give me that particular French feeling. The first is a visit to the baker's in the morning to buy freshly baked baguettes, the second is a warm croissant with butter and jam and strong coffee outside on a Paris morning. My first visit to France was in 1979. Then I visited my best pal Tor, that took his French examen baccaleureat at Lycée Corneille in Rouen in Normandy, far away from home. I stayed in his rented room in 5B rue de la Cigogne on the historic Rive Droite area for a whole week. During that visit, I was sent out to buy baguettes for breakfast, and I particularly remember being asked to buy a baguette of seize-cent grammes (1,6 kilograms), as I had to ask my friend twice, if such a giant bread really existed. It really did, it was not three feet long (as I figured, as everyone knows that a French baguette is virtually just air), but it was as long as an ordinary loaf, but flatter, very thick, rustic and well baked, with a delicious dark brown crust. I felt extremely French, as I left the boulangerie with the gigantic loaf wrapped in paper under my arm, heading home. 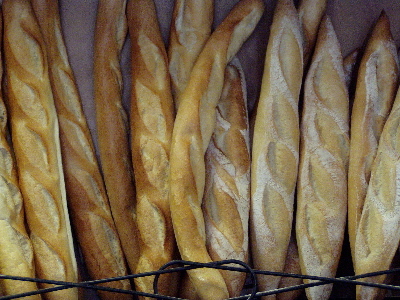 Since then I have been participating in the "going to the baker's in the morning to get a baguette"- ritual many times, and it still gives me that French feeling. Equally, I find breakfasts on small neighbourhood bars in Paris, to be a another French superb early morning ritual. During our stay in Paris a few weeks ago, me and my good friend (and Enjoy Food & Travel co.-writer) Dagfinn Skoglund engaged in these ritualized meals at Royal Turenne, located on the corner rue Franc-Bourgeois and Rue Turenne. Here you could start the day with a large meal or, as us, a simple breakfast consisting of one cup strong French coffee, peeping hot, followed by a glass of orange juice and a croissant or a "tartine", both served with butter and jam. Both alternatives were real treats. Croissant crunchy and flaky, allowing the local sparrow to pick up a few leftovers from our table (they were really tame, suggesting that we were not the first to feed them). 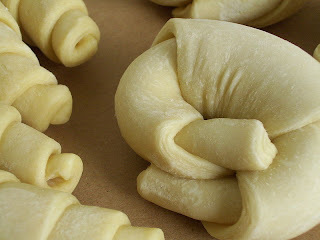 I made them super rich, by buttering and topping the pastry crescents with sweet jam. Tartine, the other alternative, was a half a baguette, deliciously crunchy warm enough to melt the butter, and divine with the jam. God, I get hungry, thinking back on our breakfast ritual. The advantage of our French breakfast ritual was that we worked up an appetite for lunch, as opposed to the ordinary hotel breakfasts where you over eat on eggs, bacon, sausages, cheese and cold-cuts. I have plans to return to Paris this fall. If so, I will continue my favourite breakfast ritual, and will, if I stay in Le Marais, return to Royal Turenne for more.